Although I live and breath Christmas year-round, it’s an annual business trip to New York that really marks the beginning of my festivities. I attempt to have both gardens put to bed, cards written and most gifts bought before I go. Then I can work and party through December knowing Christmas is in the bag. I fly tomorrow morning, so it’s been action stations. 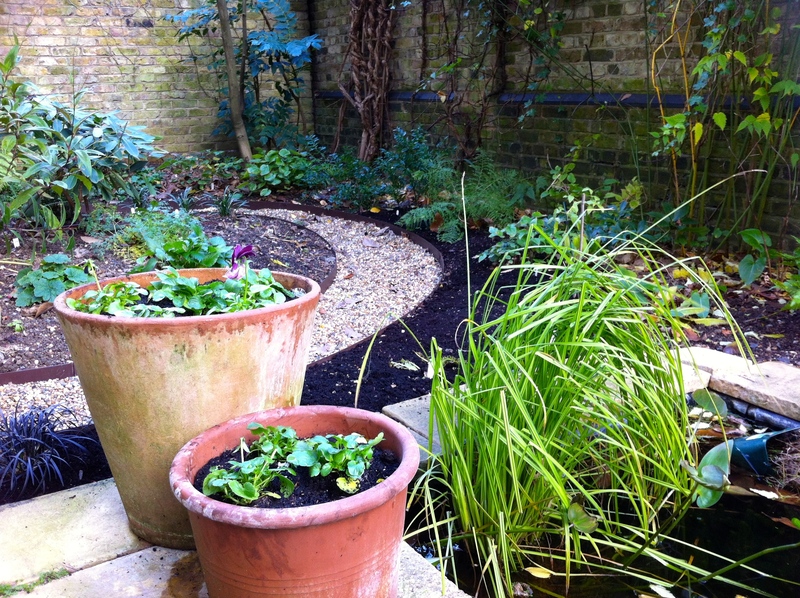 From late October until the end of February I rarely see our London garden in the daylight and today was my one and only chance to complete the planting of both indoor and outdoor bulbs. Into large terracotta pots went almost 200 tulips – a mixture of ‘Spring Green’, ‘Flaming Spring Green’ and “Greenland’. Whether that combination works or not remains to be seen, but I took the recommendation of Avon Bulbs and they can do no wrong in my eyes. Put the fire out!! 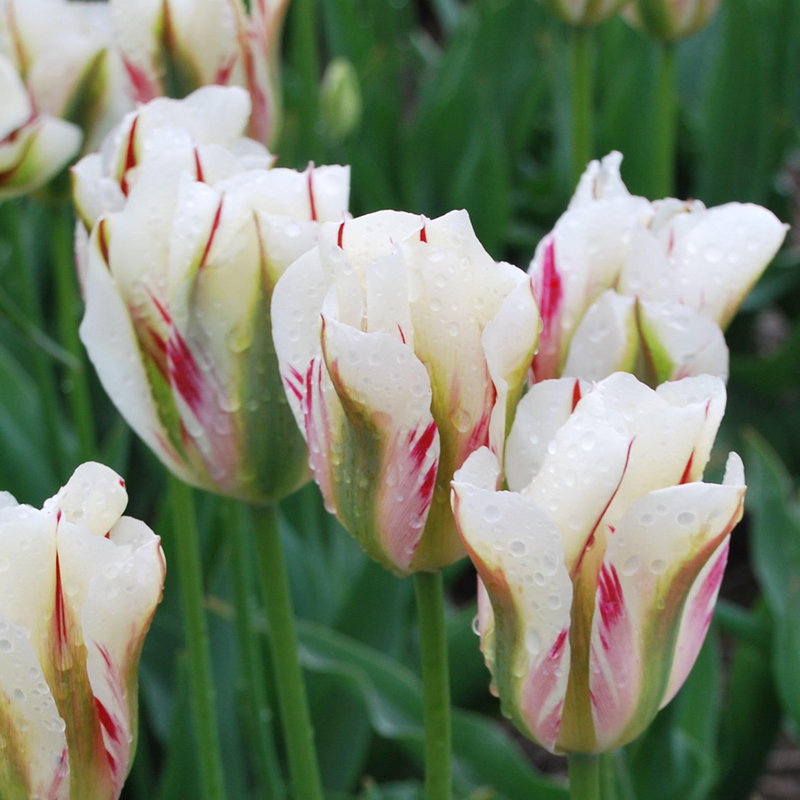 Tulipa ‘Flaming Spring Green’. As I reached the bottom of my bulb bag I discovered a plastic zip-lock bag containing five bulbs that looked like nicotine-stained fingers. 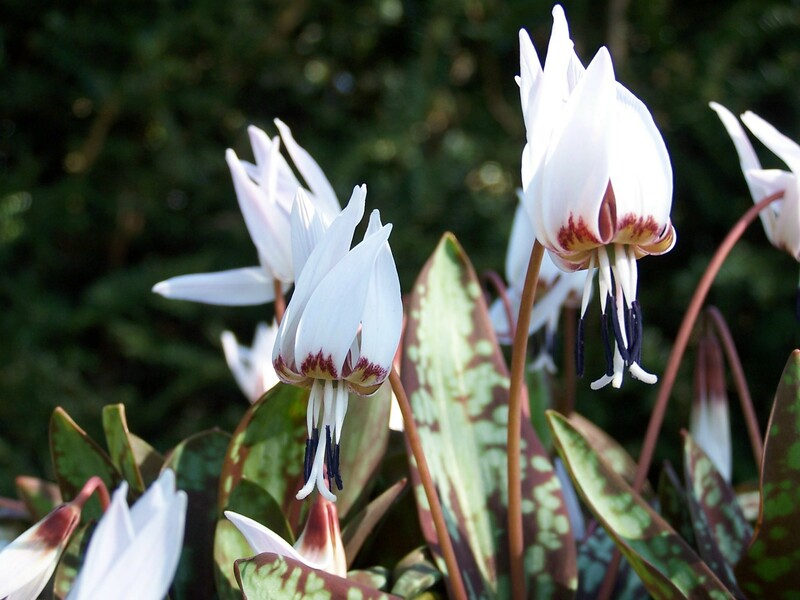 They were white dog’s tooth violets (Erythronium dens-canis ‘Snowflake’). Despite their unsavoury colour, which is quite normal, they looked fresh and plump, so I shoved them in the ground and will see what happens. If they look anything like the photograph below they will be an absolute joy. We always grow amaryllis indoors to cheer up the winter months, but this year I had forgotten to order any bulbs. All that I could find at the last minute were Hippeastrum ‘Royal Velvet’ and H. ‘Ambiance’. ‘Royal Velvet’ is a wonderful flower, the colour of opera house curtains, but ‘Ambiance’ is the amaryllis equivalent of ‘Flaming Spring Green’ and could be something of an acquired taste. 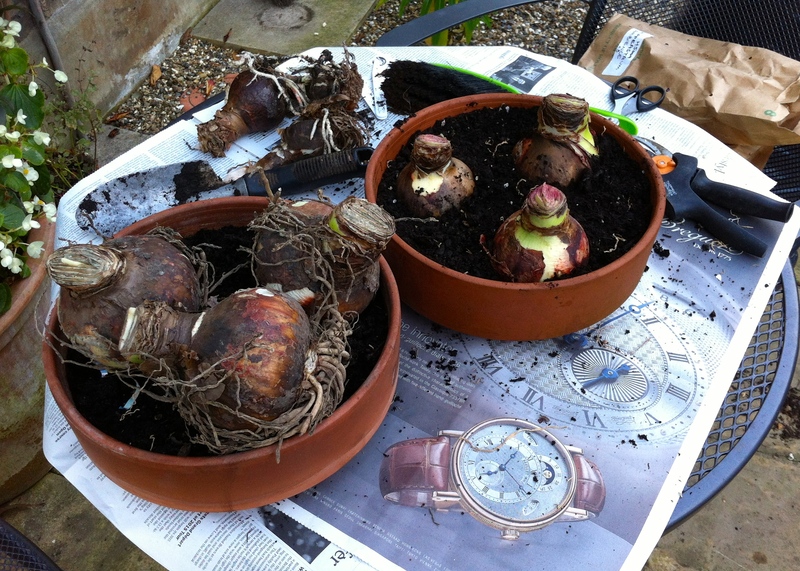 The bulbs that arrived were enormous, so could well produce two or three stems each. 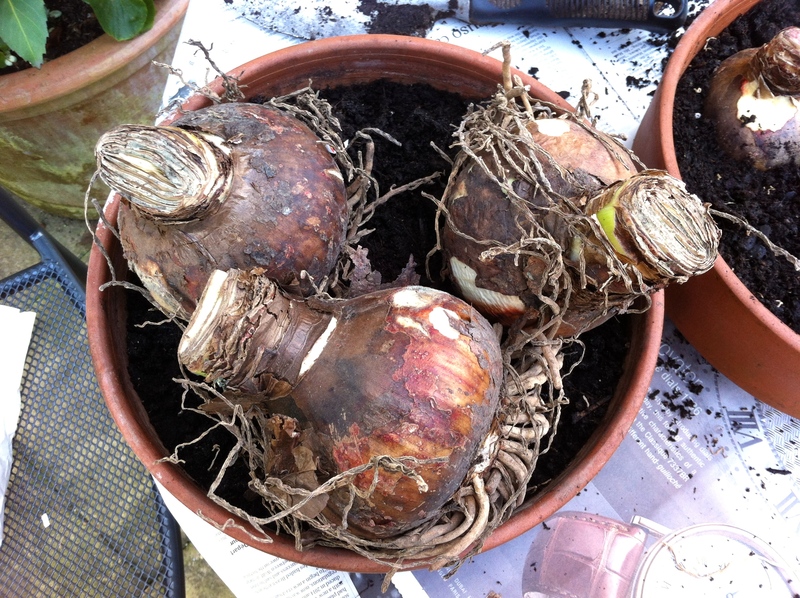 I plant three per pot, with a third of the bulb exposed. A top dressing of gravel helps prevent any soil splashes when they’re watered. After clearing up fallen leaves the cold wind finally drove me indoors to begin my packing. I never visit The Big Apple without an empty suitcase as I’m a hopeless shopaholic and normally return laden. I don’t expect this year will be an exception! Now, with birds fed, literally thousands of new bulbs in the ground, tender plants mulched and the goldfish gravitating towards the deepest part of the pond I can close the doors to the terrace knowing that everything is safe and sound until spring. I enjoy your blog very much. Very metropolitan – speaking as a salopian. Your ideas and plant choices are inspirational. I always assumed up til now that amaryllis had to be planted in deep pots. Not so? Thank you for your lovely comments! I believe most of the energy for this year’s flowers will come from the bulb rather than the roots/compost, so a shallow bowl works fine. The main issue is stability if the flowers are very heavy. The whole lot can tip out. I stick a few decorative twigs in later for support. Welcome from across the pond. I’m about 5 hours North of NYC. Hope you enjoy all the holiday festivities the city has to offer and that you have a safe trip back home. I hope you have a good trip! I wish I could say I (the gardens) was/were ready for the winter. I think I can squeeze in a few more days and then it will have to be ‘forks flying’ in the spring.